Rebbetzin Chana Schneerson, mother of the Lubavitcher Rebbe, Rabbi Menachem M. Schneerson, left a remarkable legacy. 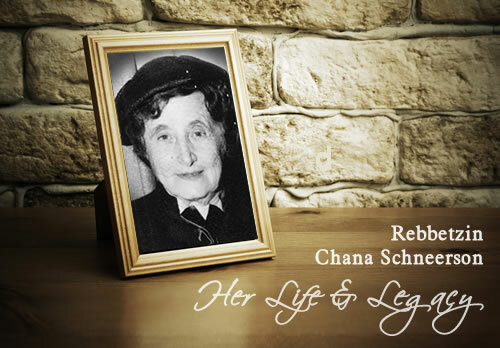 This concise biography of Rebbetzin Chana Schneerson, mother of the Lubavitcher Rebbe, Rabbi Menachem M. Schneerson, gives a glimpse of her remarkable legacy. The Rebbetzin’s story is told through fascinating text, historic pictures and handwritten letters. In a lucid and deeply personal style, the Rebbetzin drew on her rich memories of good times as well as her harrowing experiences, bringing to life the people and events that shaped her life. A collection of written accounts of the Rebbetzin’s life in both the old and new worlds. A video biography as well as personal accounts from people who interacted with the Rebbetzin, including her son, the Rebbe. On or around 6 Tishrei, the anniversary of his mother’s passing, the Rebbe would often dedicate a public address to her legacy. Here are transcripts of a sampling of those talks. The woman, the pillar of the Jewish home, has been gifted with three special mitzvot that are the foundation of Jewish living. These mitzvahs form the name of Rebbetzin Chana.